While Zinus green tea memory foam mattress is the best mattress in affordable mattresses category, Leesa mattress is known to be the best at low price in premium mattresses segment. With 2 inch soft Avenue foam on top and 6 inch base high density layer, Leesa offers both luxury and support in equal proportions. 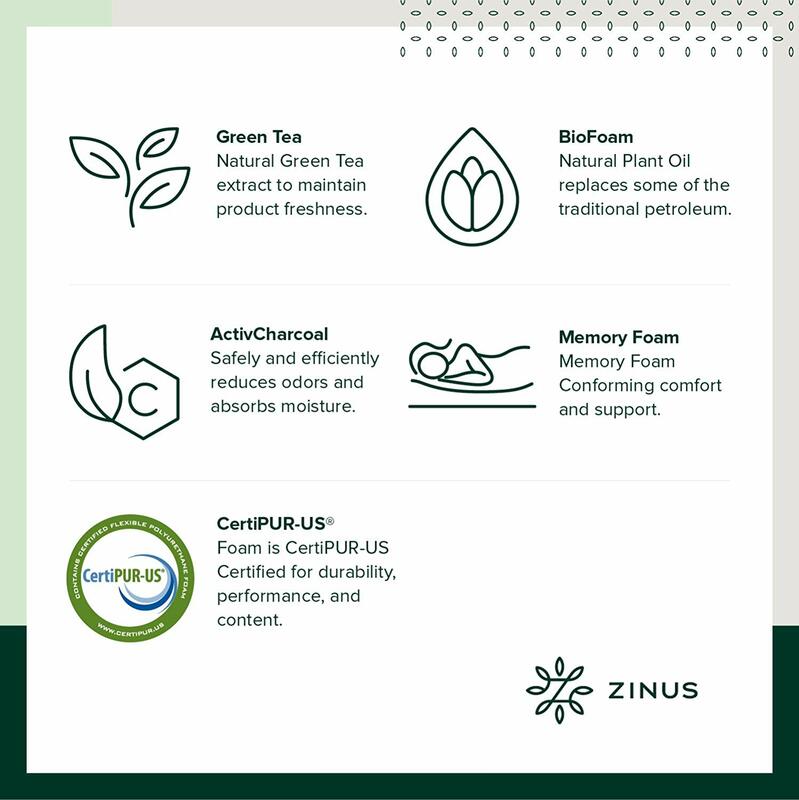 Although Zinus comes at the same price like every other affordable mattress but what makes it stand out is the green tea and castor seed oil infused into the mattress. They keep the fresh and odor free and come at the same price like every other affordable mattress. Leesa is a high-end premium mattress but the price is relatively lower than most other mattresses in this segment. The reason being, they sell direct to customer without any middlemen. Their corporate social responsibility is another factor that is worth a mention. 1 out of every 10 mattresses they sell goes to charity. Both Zinus and Leesa employed 3 layered construction. Middle layer: 2 inch comfort foam which acts as an intermediary between top memory foam layer and base high density layer. It absorbs additional weight from the top layer. Base layer: The base 5.5 inch thick high density layer, apart from offering critical support also comes with air columns for enhanced air flow and heat dissipation. Top layer: The 2 inch Avenue foam is bouncy and offers the ultimate experience of sleeping on a premium mattress. It also carries air columns that allow quick heat dissipation and better air flow that help keep the mattress sleeping surface cool and moisture free. Middle layer: The 2 inch memory foam layer conforms to your body curvature and offers pain relief. The back pain relief offered by Leesa is both unmatched and top-class. Base layer: The base layer is 6 inches thick and offers support and durability. On a firmness scale of 1 to 10, both Zinus green tea mattress and Leesa mattress stand at 6. However, the major difference between the two is the placement of memory foam layer. 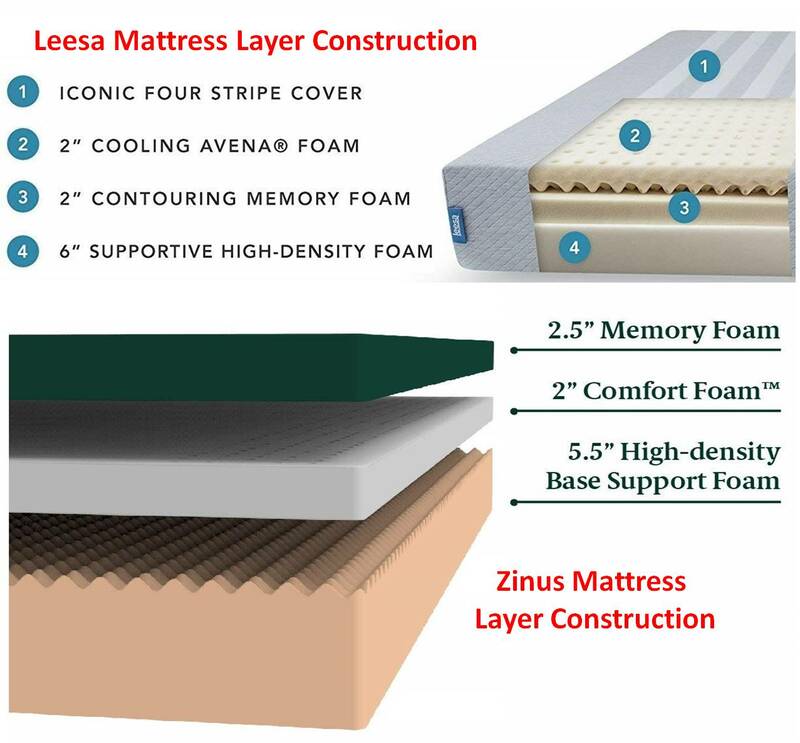 Memory foam is what offers body conformation and while it is placed as top layer in Zinus green tea mattress but in case of Leesa mattress it is placed as intermediary second layer. Leesa mattress focuses more on the offering a plush sleeping surface and hence selected Avenue foam as top layer. This foam offers some topnotch latex like bounce and helps you experience the luxury of sleeping on a premium mattress. Both Zinus and Leesa again offer more or less the same level of motion isolation. Leesa: The 2 inch Avenue foam in Leesa mattress is relatively plush and along with the 2 inch memory foam, the mattress sinks at the maximum by 3 to 4 inches. Hence, motion transfer is limited and does not reach up to your sleeping partner. Zinus: In case of Zinus, the 2.5 inch memory foam and the 2 inch comfort foam are the only layers that absorb body weight. Combined these two stand at 4.5 inches and the maximum sinkage is limited between 4 to 5 inches. And the radius of impact is again up to 5 or 6 inches and pretty much away from your sleeping partner. Edge support is limited in case of all memory foam mattresses. The higher the thickness of the base layer, the better is the edge support. Although, the edge support offered by Zinus and Leesa is more than satisfactory but the edge support in Leesa is tad better than its contemporaries owing to the 6 inch base high density layer. Smell is an innate problem with all memory foam mattresses and there is no escape from it. For quick relief, all you have to do is leave it for a good 48 to 72 hours for full expansion. And during this time keep all the windows and doors open for fast results. The better the ventilation, the quicker the smell will vanish. While Zinus offers only 10-Year warranty with its mattresses, Leesa apart from the 10-Year warranty it also offers 100 night trial period. Leesa, in any way is a better choice in premium mattresses segment. Performance wise, it falls under premium mattresses segment but price wise it stands between premium and budget mattresses. Hence, if you are looking for an affordable memory foam mattress but can also spend little more then Leesa is anytime a better option. And if you are specifically looking for a premium luxury mattress then Leesa offers you all the benefits but at a relatively much lesser price. However, if you are strictly looking for a budget mattress then Zinus is THE BEST choice. Apart from costing the same like all regular mattresses, the green tea infused into the mattress has added benefits and justifies your investment. Both green tea extract and castor seed oil in Zinus protect the mattress from harmful bacteria and also keeps it fresh and odor free for many years.